Once again the faithful at St. John the Divine gave from their hearts to needy 3rd world children. For some children this will be the first present they have ever received! A small blessing for us to give a large blessing to those receiving. Thank you all who have contributed and made this year's donation a record one, filling 131 boxes! Celebrating St. Nicholas is a favorite Nativity tradition for us. After Liturgy, Reader Zak found some special gifts for the children, hidden in the church office. Fr. Constantine and the children discussed St. Nicholas. (From the mouth of babes, it all comes down to one word, God!) The stockings were dispersed. Our choir joyously sang carols on the steps of St. John for passer-bys --- another favorite tradition! What an honor it was to have Bishop IRÉNÉE visit us at St. John the Divine on Thanksgiving weekend! Bishop IRÉNÉE and Fr. Gregory of Montreal made a visit to St. John the Divine, on their way to participate in the 15th Anniversary celebration of the founding of St. Sabas Monastery in Harper Woods, MI. 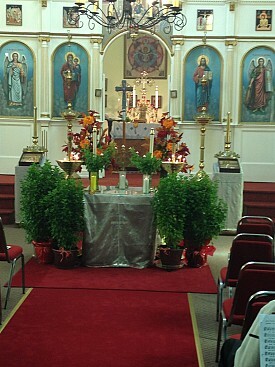 Saturday morning, Divine Liturgy was celebrated. Immediately following the Liturgy, Fr. Constantine was awarded the Gold Cross by Bishop IRÉNÉE. In his remarks, quite touchingly, the Bishop said that the Cross is actually being awarded to all of us at St. John the Divine, for our work, and struggles, in the vineyard of Christ on Drouillard Road. The entire community was awed by Bishop IRÉNÉE -- his warmth, friendliness, and humility was evident. Many Years, Master! On Sunday, September 28, 2014, St. John the Divine participated in Doors Open Windsor. This is the third time we participated in this bi-annual event. 132 visitors came to our church, asking questions about our history, and the Orthodox Christian faith. 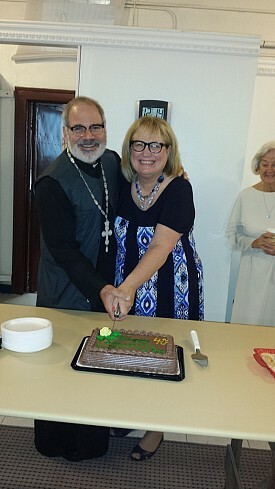 As on September 26th (the Feast of the Repose of St. John the Theologian), we celebrated the 99 year anniversary of the founding of St. John the Divine Parish in Ford City, we added a 'Birthday Party' to our celebratory theme. Downstairs, we served birthday cake, pastries, and beverages to those who came. We showed them hospitality and shared more of our history and plans for our Centenial Celebration next year. Many people worked hard to bring this event to fruition. Parishioners spent the last few months, researching more of our parish history, which we shared with visitors through pictures and word. We are especially thankful to some of our senior members who took the time to rummage through old pictures and papers. By sharing the pictures, along with names, memories & stories, the history of St. John the Divine in Ford City was brought alive to younger parishioners. Some of the ladies dressed in ethnic costume (representing the countries of Greece, Romania, Japan, and Russia). We explained to visitors that the Orthodox faith is found around the world, and that the parishioners of St. John represent world-wide ethnic backgrounds. Fr. Constantine & Psa. celebrated 40 years of marriage on August 3rd. Fr. Simion Catau, and Psa Asa, were kind enough to come to our parish, after Liturgy at the Descent of the Holy Spirit. Fr. 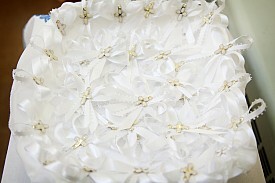 Simion bestowed a blessing on the couple. We wish them many more years of health and happiness. And, ask God's blessing that they are able to continue to serve our church family. Many years! The Chrismation of Katie V. took place on February 8, 2014 at Vespers and was completed on Sunday morning when the newly-illumined received communion for the first time. 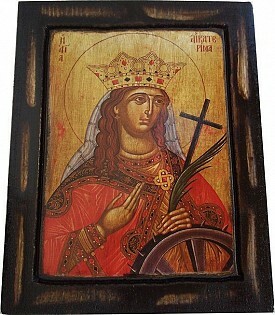 Her Patron Saint is Catherine of Alexandria. This feast, celebrated on February 2, is known in the Orthodox Church asThe Presentation of Christ in the Temple. Another name for the feast isThe Meeting of our Lord. The Feast of the Presentation concludes the observances related to the Nativity of Christ, a period that opened on November 15 with the beginning of the Nativity fast. 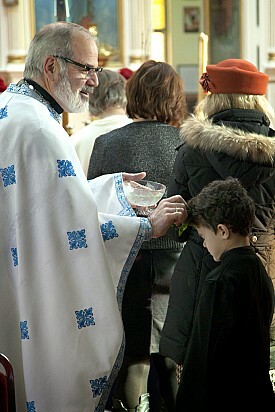 On this day, St. John the Divine also celebrated Godparent Day. Each member of the church was encouraged to bring their Godparent to take part in a special service and enjoy lunch after the Divine Liturgy. The Feast of the HolyTheophany (Epiphany) of our Lord God and Savior Jesus Christ is celebrated each year on January 6. The Feast commemorates the Baptism of Christ and the divine revelation of the Holy Trinity. At the Baptism of Christ, all three Persons of the Holy Trinity—Father, Son, and Holy Spirit—were made manifest. 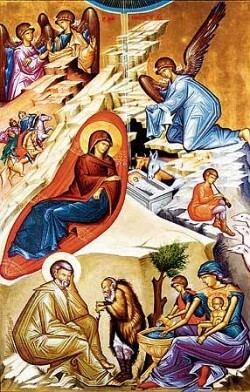 Thus, the name of the Feast is Epiphany, meaning manifestation, orTheophany, meaning manifestation of God. The tradition of baking and cutting a special "pita" each year on January 1st is observed in honor of our holy father Basil the Great, archbishop of Caesarea in Cappodocia-- hence its name "Vasilopita" meaning "St. Basil's Bread." In some places the Vasilopita is prepared as a loaf of rich bread, while in other places it takes the form of a spicy sheet cake (without frosting). 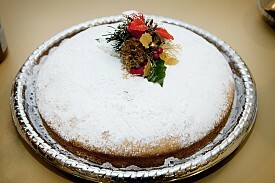 But no matter what form a Vasilopita may take, each contains a single coin. After placing the bread dough or cake batter in the proper baking pan, the baker makes with the foil-wrapped coin the sign of the Cross over it, closes his/her eyes, and then secretely places it into the unbaked Vasilopita. After the Vasilopita is baked and cooled, it is blessed and cut following Divine Liturgy for the feast of St. Basil on January 1st. This year Shannon was blessed to find the coin in the Vasilopita!